The Academy is managed by the Academy Director. In the Academy you can study and improve your skills. By clicking this link you can donate some money or items to the Academy. 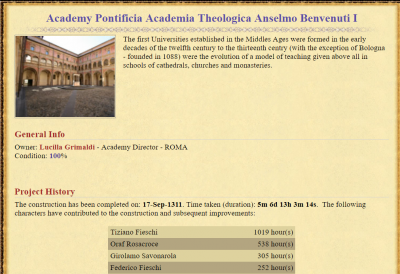 By clicking this link you will see some information about who founded the Academy and who contributed to build it. By clicking this link you will be able to study to improve your attributes (intelligence or charisma) or gain skills. You can study the course at a level that will increase your current attribute value by 1. For example, if your carisma is one, you will be able to study a level 2 course. The time for completing a course increases directly with the level. In order to learn a skill you will need to study or train a certain number of hours, depending on the number of skills you have. You will need to hold a Writing Kit in order to study. The Academy Director should assure that the Academy has enough paper. A single piece of paper can be used for one hour of lesson. The Academy Director can deposit paper pieces in the Academy storage. You can see what's stored in the structure and take stored items. You can set a hourly wage for people who will help upgrade the structure. You can set a description for the structure. You can set an image for the structure. Academy Director can rest in the structure. 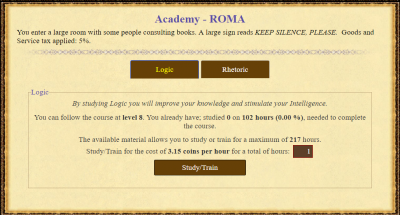 In this page the Academy Director can set the Lessons Hourly Price. In this page the Academy Director can start the activities to upgrade the structure. This page was last modified on 11 May 2018, at 19:27.